While brewing in Britain pre-dates the Roman invasion in 54AD, its evolu-tion has helped to propel the food and beverage industry to become the country’s largest manufacturing sector. The Task: For the UK brewery Adnams expansion of the portfolio in the recent years led to a higher demand and workload. Due to these factors they were looking into new solutions for the palletising of the barrels and kegs. The Solution: Already in 2017 FANUC installed a R-2000iC/165F robot to internally do the keg palletising. In 2018 the R-2000iC/210L followed and now all of the brewery’s cask and keg beers are handled and loaded by robots. The Result: Not only consistency and speed could be increased but also the employees could be relieved from the heavy lifting and therefore health and safety issues can now be prevented. 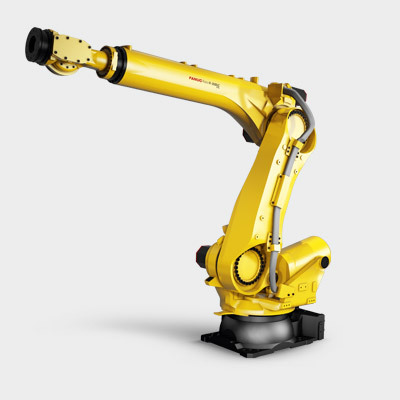 R-2000iC/165F - the flexibility offered by this 6 axis high-payload model sets new standards in almost every industry. While brewing in Britain pre-dates the Roman invasion in 54AD, its evolution has helped to propel the food and beverage industry to become the country’s largest manufacturing sector. As techniques have been honed over the subsequent centuries, numerous breweries have established themselves as household names. Adnams still operates out of its original 18th century site in Southwold, but its commitment to tradition has not stopped it implementing a 21st century end-of-line automation solution. The brewery still operates out of its original site at the heart of Southwold, and produces the equivalent of 1,900 barrels of beer a day. However, fitting a 21st century brewery into a 19th century building has proved to be an on-going challenge for Fergus and his team, as they have looked to keep pace with modern brewing methods and rapidly expanding consumer demands for a much wider portfolio of beers and spirits. One area where the brewery has looked to take serious strides forward is the introduction of automation; and more specifically, the use of robotic end-of-line palletising systems to process the beer barrels once they have been filled. 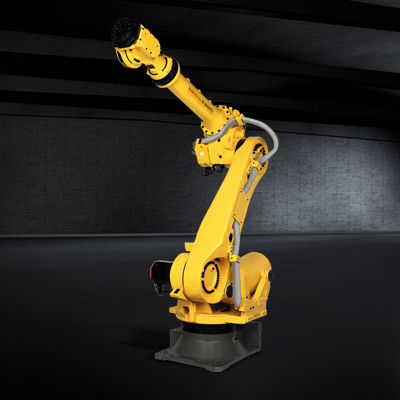 In order to meet the significant load demands of handling metal barrels filled with over 160 litres of beer, FANUC specified its R-2000iC/210L 6-axis palletising robot. With a maximum payload of 210kg, it could comfortably process the full casks at the required rate of 250-300 barrels an hour, to keep pace with the beer as it came out of the filling line. With a compact footprint of 771mm x 610mm, and a reach of 3100mm, it can easily operate within the confined working environment of the brewery. Crucially, the robot body is IP54 rated, to protect it from the residual beer found throughout the cask filling line. However, the R-2000iC/210L was not Adnams’ first foray into robotics. Back in 2017, in response to the growing popularity of keg beers, Fergus and his team decided to expand Adnams’ keg programme. Up until then all non-cask beer was sent away for kegging, but the brewery wanted to bring that process in-house at its main site in central Southwold. This involved finding space for conditioning tanks, as well as filtration and kegging equipment. The final piece of the puzzle was the addition of a FANUC R-2000iC/165F robot within the kegger, which was used to lift and stack the newly filled kegs. While this was on a much smaller scale compared to the brewery’s cask line, its success paved the way for the much larger system, which followed on the cask filling line in 2018. Following the finished installation of the R-2000iC/210L in 2018 and the FANUC R-2000iC/165F in 2017, all of the brewery’s cask and keg beers are now handled and loaded by robots. However, there was another underlying factor, which helped tip the balance in favour of a robot loading system, rather than a like-for-like palletiser. “One of the main reasons we chose the robot system – aside from floor-space – was that we wanted to move away from wooden pallets, which we’d been using for years, and start using plastic locator boards,” says Fergus. Locator boards are durable plastic interlayer boards which allow barrels to be stacked securely and safely on top one another. At Adnams’ cask palletising system, the FANUC R-2000iC/210L will pick six filled casks off the line and place them on a conveyor in two rows of three. The robot will then select a locator board from a magazine stored within the cell, and place it on top of the six barrels, before collecting the next six barrels from the filling line and stacking them on top. This process is repeated until there are 18 barrels securely stacked, before they are moved to the end of the conveyor where they can be collected by forklift truck and either loaded directly onto a distribution lorry, or stored nearby until ready for collection. 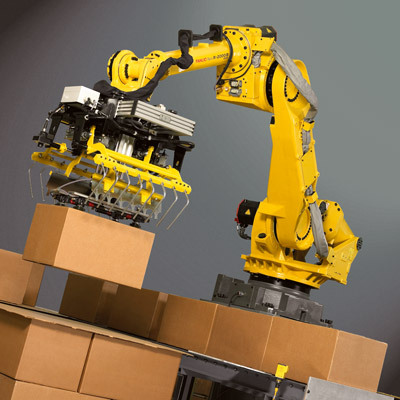 For more information on FANUC’s range of palletising robots, please visit: https://www.fanuc.eu/uk/en/robots.